Thyroid cancer affects a lot of people. In fact, about 56,000 people get a diagnosis each year in the US alone. And most of the diagnoses are the most common type – papillary thyroid cancer. While women are more likely to get thyroid cancer than men, everyone runs a risk. Furthermore, although thyroid cancer can appear at any age, it is more common past the age of 30. Most thyroid cancer types will get more aggressive as the patient’s age increases. As far as symptoms go, thyroid cancer doesn’t usually present any symptoms, and the initial sign of it is usually a nodule on the thyroid. The good thing about thyroid cancer is that there are some extremely effective thyroid cancer treatment options available. Although it is somewhat rare for thyroid cancer to present any symptoms, on occasion, you may experience some neck pain, a loss of your voice and an enlarged lymph node or two. The tumor will present itself in a thyroid nodule. Although up to 75% of the population has these, most are just benign. While papillary thyroid cancer is the most common form, there are three other types of thyroid cancer with varying levels of rarity. 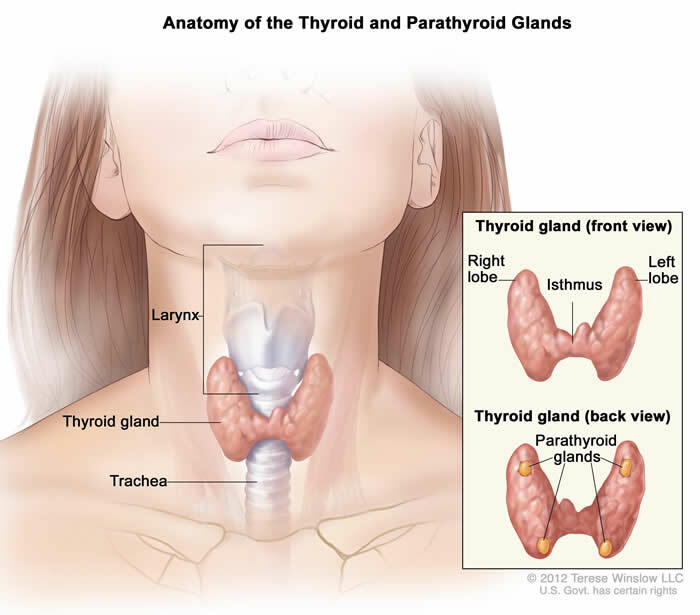 Papillary thyroid cancer accounts for about 80% of thyroid cancers while follicular (also known as Hurthle cell) thyroid cancer accounts for 15%. Medullary thyroid cancer accounts for about 3%, whereas anaplastic thyroid cancer comes in at around 2%. In young patients especially, follicular and papillary thyroid cancers have more than a 97% success rate with proper treatment. The treatment for these two more common types generally entails removing the lobe of the thyroid that has malignant cells, or in some cases all of it. While it is a very rare form, medullary thyroid cancer is unfortunately much more difficult to treat. It tends to spread rather quickly quite early on, therefore requiring a more aggressive treatment upon discovery. In order to treat this form of cancer, you must completely remove the thyroid as well as the lymph nodes on both sides and in front of the neck. The last form of thyroid cancer, anaplastic thyroid cancer, has the worst prognosis of them all. The treatment for this form of cancer is extremely aggressive and unfortunately is often not successful. It requires surgery to remove the tumor, which often fails as it’s usually not found until after it has spread quite a bit. Most patients will usually need a tracheostomy during surgery as well. Chemotherapy is a very common treatment for a lot of cancer types and can actually be especially effective since thyroid cells have a unique trait. Unlike any other cells in the body, thyroid cells will absorb iodine. In fact, they need to do so in order to function. This offers a perfect strategy for a complete cure in the case of papillary thyroid cancer. Once the patient has undergone surgery for the removal of the tumor, they are then given radioactive iodine. Because thyroid cancer cells most often retain the same ability to absorb iodine, any remaining cancer cells will absorb this poisonous iodine, which will then destroy them. The healthy thyroid cells will remain unharmed, however, as they will not absorb anything toxic. Most patients, if not all, will receive this thyroid cancer treatment after surgery as the survival rate is extremely high. Overall, a radioactive iodine treatment is extremely safe, so if it is an option, take it. While there are many different forms of thyroid cancer, the good news is that the most common kind is very treatable and has a very high survival rate. While getting diagnosed with cancer is always an awful thing, knowing about high survival rates should be comforting. In most cases, surgery followed by a radioactive iodine treatment will take care of the problem. In other words, you’ll back to leading a normal and healthy life in no time.